At the youthful age of twenty-two, the Portuguese musician Pedro Pimentel has quickly solidified his position as a monumental force in the realms of dark ambient. It’s not only praise from the Cryo Chamber fan-base or label-mates that has proven Pimentel’s strengths as a musician. He’s also worked closely with Robin Finck of Nine Inch Nails on the soundtrack for the videogame Noct. All this being accomplished before most musicians have come close to finding their true calling, it’s hard to tell what Pimentel will have accomplished ten years from now. In my opinion, his first major accomplishment has just been actualized. 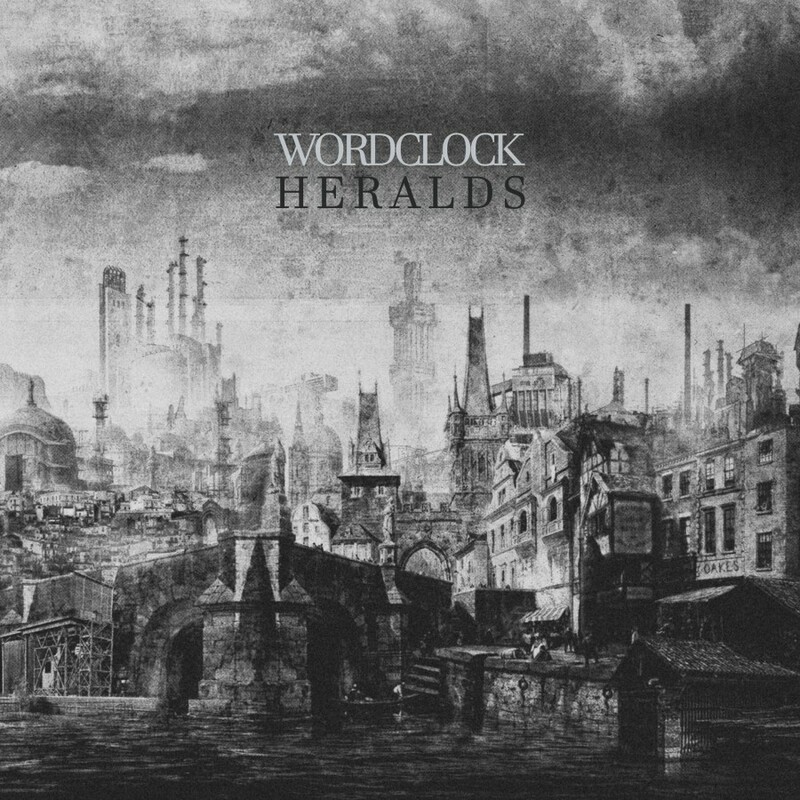 Heralds is the third release by Wordclock on Cryo Chamber. All the brilliant techniques Pimentel has shown over his last few albums have come to an utter climax on Heralds. This album finds itself on the fringes of the dark ambient genre, and yet it couldn’t be more in line with the goals of the genre, and particularly the Cryo Chamber label. It’s not exactly the originality of Heralds which makes it work so well. Many of its various elements can be heard in the music of other artists such as raison d’etre, Enmarta, Phonothek and Elegi. But it’s the seemingly effortless blending of these different elements which makes Heralds praiseworthy. The opening track brings us our first taste of this marriage of styles and techniques. Wordclock has used the piano and bass guitar previously to successful ends, but the introduction of the cello into his music has taken it to new heights. The cello, I’m convinced, is one of the best live instruments to be incorporated into dark ambient music. Each instance I’ve heard this combination throughout the last few years has been gloriously successful. For the task, Pimentel has brought back Norwegian classically trained cellist Amund Ulvestad. His skills could also be heard on the previous Wordclock album, Self Destruction Themes. Ulvestad was first brought to my attention in 2014 as part of the Northaunt/Svartsinn split, The Borrowed World, which I still highly recommend to any readers that haven’t yet experienced it. Soon afterward, I saw him live when he toured the United States east coast performing as a duo with Svartsinn. His contributions to Heralds can’t be overstated, whenever his craft is featured the album all the better for it. Yet, Ulvestad is far from being the only addition of note to this Wordclock release. Pimentel brings in the talents of Nuno Craveiro on the Scandinavian instrument Nyckelharpa. An instrument which has gotten some mainstream recognition recently, being used by the atmospheric black metal / Nordic folk artist Myrkur. The third addition to Heralds is George Shmanauri on trumpet. We’ve heard his trumpet work add an intriguing dark jazz flavor to his two recent albums as half of the duo Phonothek, also residing on Cryo Chamber. When all these musicians come together, the outcome is blissful perfection. The track “Where Mercy Lives” is the crowning glory of Heralds. Pimentel brings together all of his previous experience as a solo artist and blends it with the works of these three guest musicians. Add to that some samples of choir vocals, and what we have is probably my favorite dark ambient track of the year, if not of recent years. The combination of these artists gives us a hint of what an all out dark jazz project would sound like, if they were all so inclined to create one. The music has so many noteworthy layers, that it could warrant a full review treatment itself. Suffice to say, readers must give this track their full attention, preferably through the best audio deliver system on hand, in order to appreciate the extent of its accomplishment. It is said in the album blurb that Pimentel traveled far and wide, through Porto, London and Berlin, in order to collect the acoustic instrument sounds and field recordings necessary for completing this opus. It’s as if not only the sounds collected, but the travel itself is harnessed on Heralds. Pimentel gives us a completed album which could traverse the boundaries of dark ambient, finding praise from followers of multiple genres, including but not limited to, dark jazz, neo-classical, ambient and northern European folk. It has been apparent since his debut, Endless, that Pimentel was a musician to keep an eye on. That sentiment has never been more apparent than now. With the release of Heralds, Pimentel shows the staggering extent of his ambition and skill as a musician and a studio technician. I simply can’t overstate the magnitude to which this album has moved me, and I strongly suspect that it will have the same effect on many, if not most, readers of this review.